Published: Aug. 20, 2014 at 07:54 p.m.
You want to get the home crowd riled up at a football game? Deliver a big hit. The only thing better than a big hit to get a crowd really going is a big play on offense. That means that the 14 players you will be reading about in less than a minute are fan favorites. That's because these players are known as big hitters. Truthfully, every team has a player (or two) known for being able to lay the wood; in some cases, that's all the player can do. But the home crowd loves them for that ability. Our "14 for '14" series continues with 14 big hitters who have caught our eye. Particulars: 5-foot-11, 200 pounds, senior. Buzz: He is a ballhawk (13 combined interceptions the past two seasons) who plays with an extremely physical nature; he was tied for second on the team with 87 tackles last season. 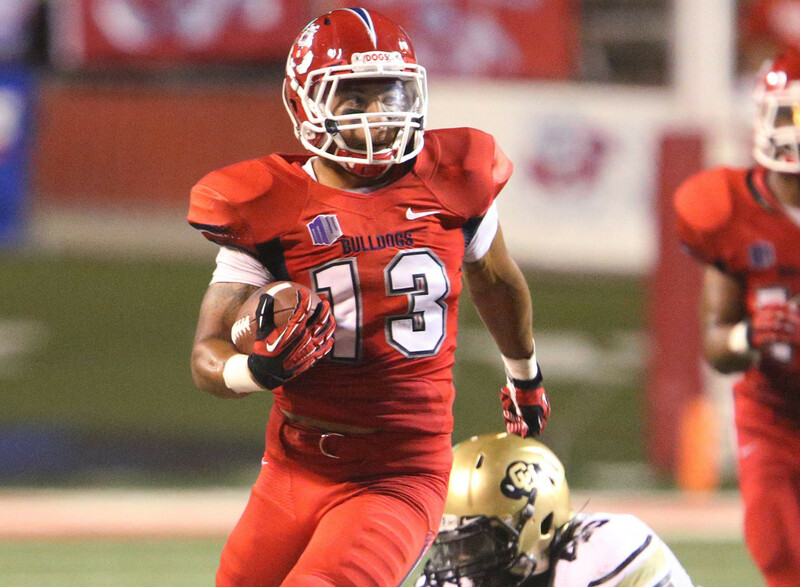 He has started for two seasons and been an All-Mountain West Conference selection twice. He had eight tackles for loss in 2013, and is as comfortable playing center field as he is coming up and laying a lick on a running back. Buzz: He was overshadowed last season by Huskies SS Jimmie Ward, who became a first-round pick by the San Francisco 49ers, but Durante will be in the spotlight this season. He will be a four-year starter for the Huskies and has seven picks and nine pass breakups in his career to go with a multitude of big hits. He has forced five fumbles in the past two seasons. Buzz: He was recruited as a corner and played as a reserve at that position as a true freshman in 2011. He was moved to strong safety in the spring of 2012 and has started all 26 games since. In addition to being a big hitter, Jarrett puts his old cornerback skills to good use as a solid cover guy. He also has had success as a good punt returner, proving that big hitters don't have to be big, stiff guys who have no lateral movement. Buzz: Last season was his first with the Lobos after transferring from junior college and he made an immediate impact, starting all but one game and finishing third on the team with 65 tackles. During the recruiting process, his junior college coach lauded Guthrie for his hitting ability, and Guthrie showed off that ability last season. Guthrie certainly isn't the fastest or the biggest safety around, but he lays the lumber. And get this: He could be the Lobos' punter this season. Hey, wouldn't it be great to see a punter get off a booming kick, then run downfield and de-cleat the return man? It could happen with Guthrie. Buzz: Come on -- with that name, he has to be a big hitter. Just ask former Alabama QB AJ McCarron, who was terrorized by Striker in OU's upset of the Tide in last season's Sugar Bowl. Striker is known for his pass-rush abilities; he is on the short side for a pass rusher, but he overcomes his lack of height with good speed off the edge. And when he gets where he is going, chances are he's delivering a big blow. Buzz: What's this -- a big-time cover corner who also is a big hitter? Yep. Ekpre-Olomu thrives in run support, and secondary coach John Neal has called him "a vicious football player." He was second on the team with 84 tackles last season and has 147 tackles, seven forced fumbles, seven interceptions and 22 pass breakups the past two seasons. He is expected to be one of the nation's top two or three corners this fall. Buzz: He's a contender to lead the nation in tackles this season; last season, he led the Sun Belt with 134, which tied for seventh nationally. Lee, who sported a distinctive faux-Mohawk dyed a reddish-orange last season, had double-digit tackles in seven games, including three contests with at least 15 stops. His relatively small size doesn't stop him from doling out a ton of punishment; he makes a lot of tackles, and a lot of them are punishing hits. Buzz: He will be a four-year starter for the Trojans and has led USC in tackles in two of his three previous seasons. He's not overly big, but he runs well for a 'backer (he ran the 100 meters for Los Angeles' Crenshaw High as a prep star) and is a punishing hitter; he has forced three fumbles in his career and also has nine pass breakups. Buzz: He was considered the No. 1 safety and one of the top five prospects overall nationally in the 2012 recruiting class, but he hasn't played that position with the Huskies. He started every game at nickel back as a true freshman in 2012, then gained 20 pounds and moved to linebacker last season. He should vie for All-Pac-12 honors this fall, and he also expects to see time at running back; he showed well at that position in limited action in spring practice. That means he will be doling out punishment as a runner and a tackler. Buzz: Collins, a Louisiana native, famously upset his mom when he picked Alabama over LSU in the recruiting process. Now he is known for upsetting opposing players and fans with some of his big hits. Collins runs well (he reportedly has been clocked in 4.39 seconds in the 40), and he generally isn't in a good mood when he gets where he is going, which makes things unfortunate for opposing wide receivers and running backs. Alabama was loaded at safety last season with Ha Ha Clinton-Dix and Vinnie Sunseri, but Collins still started nine times and finished second on the Tide with 70 tackles; he also forced two fumbles. In addition to being a physical tackler, Collins is an excellent athlete whose vertical jump has been measured at 43.5 inches. Buzz: He's the son of former University of Miami linebacker Rohan Marley, a small guy who was known for his bone-rattling hits. And he's the grandson of former reggae superstar Bob Marley, who had a few hits of his own. If there's a smaller starting linebacker in the college ranks (heck, Marley is short for a cornerback, for goodness sake), we haven't found one. But his lack of size doesn't stop him from trying to absolutely lower the boom a few times per game. Marley was the Green Wave's third-leading tackler last season (68 stops) and was second on the team with 11 tackles for loss. Buzz: Older folks probably have heard reference to defenders who deliver "slobberknockers" -- hard tackles that cause the offensive player to, plain and simple, slobber. Frankly, Perryman delivers "snotknockers," as in hits that plain knock the snot out of people. He is a physical, aggressive player who makes up for his lack of height (let's stress that he is listed at 6-0) with tremendous instincts, which means he frequently is in position to deliver some "snotknockers." Perryman was an All-ACC pick last season, when he led Miami with 104 tackles as an outside linebacker. His numbers should go up this season because Perryman has moved to middle linebacker. Buzz: He is better in run support than he is in coverage -- maybe not the best thing if you're a free safety -- but opposing receivers must make sure they know where he is because, man, Joseph hits a ton. Quite simply, he's a tough guy who loves to deliver a big hit. He lacks consistency as a coverage guy and frequently spends too much time looking for the big hit -- but did we mention that Joseph hits a ton?